Encaustic tiles are attractive, practical and very hard wearing. From as far back as the 1860s, encaustic tiled floors started to appear in public buildings, churches and some of the more upmarket Victorian homes. It’s unfortunate that these floors fell out of fashion during the 1960s and 1970s, but they’re now being rediscovered by property owners and restored to their former glory. Encaustic, or Moroccan, tiles were handmade by artisans in Morocco in the late 1700s and are ‘imperfect’ – each tile differs slightly from the other. They are classic, colourful and one of the most long-lasting coverings for floors and walls. Patterns and colours can be coordinated to blend in with almost any décor design. By the 1890s, these tiles had become a feature of most Victorian terraced houses throughout the UK. Some domestic interior tiled floors have survived for over 100 years, and will probably be good for another 100. There can be few other floor finishes that can look so good, while being so durable. There were two periods when encaustic tiles enjoyed great popularity. The first was in the 13th century – this lasted up until the reformation in the 16th century. The second came when the tiles captured the attention of craftsmen during the Gothic Revival era (the mid-19th century). After much trial and error, mass-produced tiles were made available to the public. Encaustic tiles also became fashionable in the USA and Latin America and quickly spread to the Caribbean and to the rest of the world. Encaustic tiles enjoyed a great popularity during the Art Deco period and you can sometimes still see them in houses in Spain and the South of France where they look as beautiful and elegant as when they were first laid. In recent years, these slightly imperfect but stylish tiles with their lovely character, have regained popularity. Companies who made plain geometric tiles also made encaustic (patterned) tiles, using a medieval technique that was re-invented by Herbert Minton. This involved inlaying layers of different coloured clays to form the design. Encaustic tiles were normally only two-colour – the body of one colour, blue, for example, was impressed with a pattern filled with a different colour, say, red. But there are also plenty of encaustic tiles with three and four colours and more. The Palace of Westminster, for instance, has tiles that are 5- and 6-coloured. Encaustic tiles weren’t used as often in geometric designs because of the expense – plain geometric tiles were much cheaper. A strange thing about these tiles is that different inlay colours wear at different rates, so it’s not uncommon to find one particular colour completely worn away. Encaustic tiles are made in a mould that contains a mixture of cement, marble powder and pigments. After being hydraulically pressed, they’re dried. Technically, the word ‘encaustic’ is in fact not correct as it refers to a paint that is fixed by heat. Encaustic cement tiles are environmentally friendly, and are created using basic earth components. They’re not fired in a kiln, and therefore don’t release any fumes or dangerous fossil fuels in the manufacturing process. The tiles are handmade and entirely natural. They’re made of marble powder, natural stone granules, cement, sand and natural colour pigments, and are the most long-lasting, decorative and elegant floor and wall tiles around. Archaeologists recorded that the first cement tiles were made in Morocco in the late 1700s. In 1850, however, the quality was dramatically improved when a Frenchman, Felix Guilhon, developed a hydraulic press. Using this new technology, the tiles quickly spread throughout the USA and Europe. 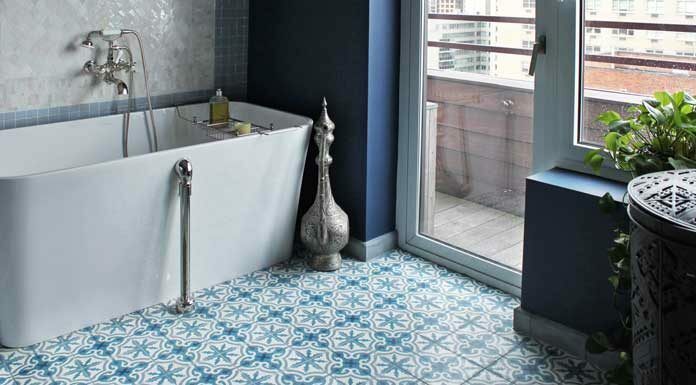 Where can encaustic tiles be used? Encaustic cement tiles can be used for floors, stairs, walls and facades, and can be seen in homes, old buildings, offices, hotels, restaurants, stately homes and places of worship. The patterns, or figures, on the surface of encaustic tiles are not due to the glaze but due to the different colours of clay used. Although tiles usually have only two colours, some are made up of as many as six. The pattern is inlaid into the body of the tile, so the design remains intact as the tile wears down over time. Some are glazed, while others not, and the inlay can be as shallow as an eighth of an inch – this was often the case with ‘printed’ tiles from the medieval period, but later tiles were as deep as a quarter of an inch. This article was written by Dakota Murphey, independent content writer working alongside The Brighton Bathroom Company, who were consulted for some of the information in this post.